Researchers from Shinshu University, Japan, have created strong reverse osmosis membranes that can tolerate large-scale water desalination. The results of their research were published in early February in Scientific Reports. "Since more than 97 percent of the water in the world is saline water, reverse osmosis desalination plants for producing fresh water are increasingly important for providing a safe and consistent supply" said Morinobu Endo, Ph.D., corresponding author on the paper. Endo is an eminent professor of Shinshu University and the Honorary Director of the Institute of Carbon Science and Technology. "Even though reverse osmosis membrane technology has been under development for several decades, new threats like global warming and increasing clean water demand in populated urban centers challenge the conventional water supply systems." Reverse osmosis membranes normally are made up of thin film composite systems, with an active layer of polymer film that hampers unwanted substances, such as salt, from passing through a permeable porous substrate. Such membranes can convert seawater into drinkable water, as well as help in landscape and agricultural irrigation, but they can be expensive to operate and consume a large amount of energy. To match the demand of potable water inexpensively, Endo says more strong membranes capable of enduring challenging conditions, while remaining chemically stable to tolerate cleaning treatments, are essential. The key lies in carbon nanotechnology. Endo is an innovator of carbon nanotubes synthesis by catalytic chemical vapor deposition. In this study, Endo and his team created a multi-walled carbon nanotube-polyamide nanocomposite membrane, which is resistant to chlorine--one of the primary causes of degradation or failure cases in reverse osmosis membranes. The incorporated carbon nanotubes create a protective effect that stabilized the linked molecules of the polyamide against chlorine. Carbon nanotechnology has been expected to bring benefits, and this is one promising example of the contribution of carbon nanotubes to a very critical application: water purification. Carbon nanotubes and fibers are already superb reinforcements for other applications in materials science and engineering, and this is yet another field where their exceptional properties can be used for improving conventional technologies. 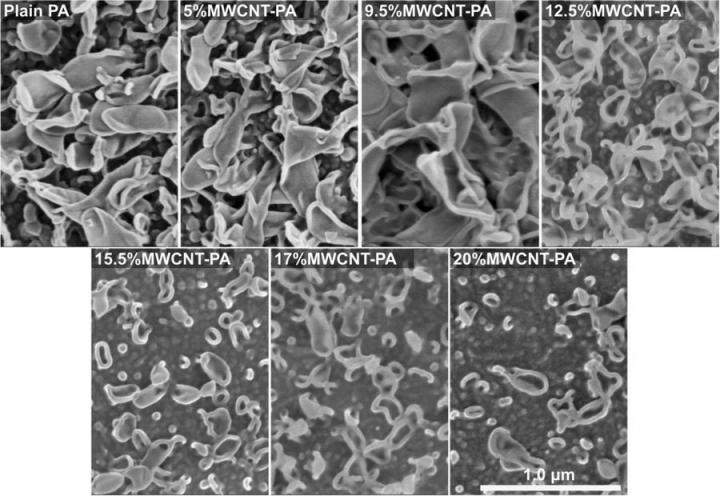 The researchers are attempting to stabilize and expand the creation and processing of multi-walled carbon nanotube-polyamide nanocomposite membranes. "We are currently working on scaling up our method of synthesis, which, in principle, is based on the same method used to prepare current polyamide membranes," Endo said. He also added that his team is planning a collaboration to create commercial membranes. This research was conducted as a part of the Shinshu University Global Aqua Innovation Center for Improving Living Standards and Water-sustainability supported by the industry-academia collaborative R&D programs, COI- STREAM, of Japan Science and Technology Agency (JST).